This home, located at what is now 154 Old Derry Road, became a part of our town’s history in 1828 when it was purchased by Nottingham West (now Hudson) and used as the town Poor Farm or Alms House. In those days the resident poor were kept at the town farm; those who could worked the farm in an effort to produce food for all residents of the farm. The town maintained this farm for some 40 years until 1868 when the farm was sold and the few paupers which existed at the time were boarded out to private homes at the expense of the town. It was common for towns in this area to maintain a poor farm, supervised by the Overseer of the Poor. It was, in essence, their welfare system. As uncomfortable as this concept makes us feel, we need to realize there were no pension plans, no social security, no food stamps, no insurance to address medical and or hospitalization expenses. Any number of life events could have caused one to end up at the poor farm: living beyond ones means, mortgage foreclosure with no options to refinance, not making plans for your old age or for your widow after your death. Couple any of these events with no family able or willing to to care for you could place one in this desperate situation. By 1869, with the Town of Hudson providing for the poor by boarding them in private homes at the town’s expense, the town farm on Old Derry Road was sold to members of the Senter family. Proceeds from the sale were used to assist families of veterans of the Civil War. The home at 154 Old Derry Road, the former Alms House, is now the delightful home of Al and Marikaye Garnett and their family. The Garnetts purchased the home some 25 years ago in 1992. I had the opportunity to visit with Marikaye in the living room of their home just before Thanksgiving. As you enter the home from the steps leading to the three season room (previously a summer porch); you enter the beautifully rustic but modern kitchen. From there we entered the living room. Sitting on one of the couches I had a complete view of their back yard with a fenced in swimming pool. Beyond fence was a field leading to a wooded area. Just before the wooded area one could see the iron chain fence installed by the Town of Hudson to identify the location of the Poor Farm Cemetery. We spoke of the master bedroom which previously was the common area or social center for the residents of the poor farm. The stone fireplace, paneled walls, and large picture window gave no sense or memorabilia of the town paupers who called this house their final home. Any such reminders are behind the dry wall or the paneling or on the beams of the attic. Prior to moving into 154 Old Derry Road the Garnetts performed a tradition common to their faith, a house blessing. They went from room to room praying and telling Jesus they wanted to use this house for His glory. O yes, they have heard stories and experiences of previous owners; but for themselves, these past 25 years the house has been at peace. Within my memory this house has been home to members of the Farrington (1985 – 1992), Gould (1970-1985), Mazzarella (1966-1970) and Dube (1940 – 1966) families. In 1940 Albert and Lydia Dube moved their family of five (Theresa, Gertrude, Alice, Leo, and Claire) into the old farmhouse. A second son, Paul, was born a few years later. The farmhouse was on one side of the road; the barn nearly opposite the house on the other side of the road. Here the Dube family resided; working and living on the family farm, delivering milk to the local dairy for processing, attending local schools, and participating in 4-H activities. When farming activity had ceased Albert and Lydia converted the barn into a house for himself and his wife, Lydia. After the remainder of the farm was sold in 1966, they continued to live in what had been their barn. This house at 157 Old Derry Road is now home to their grandson Neil Lavoie and his family. Attached to the garage ceiling is a large antique hay fork . This was used to lift the loose hay from the hay wagon up into the loft of the barn for winter storage. This relic remains as a fond reminder of the farming days of their family. Of the six members of the Dube family, five are living in New Hampshire and one in Florida. The oldest, Theresa at age 90, lives in a retirement community on Webster Street here in Hudson. Gertrude, next oldest, lives in Florida. Alice and her husband George Lavoie reside in Londonderry. Leo, the oldest son, graduated from Alvirne, served in the Air Force and later established a veterinary practice in Henniker. He has since retired. Claire graduated from Alvirne and she and her husband Paul Bouffard live in Bartlett, and Paul, the youngest is living in Hookset. Today’s photo, taken by the author, shows the Garnett home, the former alms house, at 154 Old Derry Road as seen today. The Cemetery of the Unknown was a part of the town poor farm located in the north west section of Hudson on what is now Old Derry Road. For this cemetery there are no monuments, no headstones, and no records to identify the individuals buried there. The farm was purchased by the town in 1828 in the days when the resident poor were kept at the town farm. Those who could worked the farm in an effort to produce food for all residents on the farm. The town maintained this farm for some 40 years until 1868 . At that time the farm was sold and the few paupers which did exist at the time were boarded out to private homes at the expense of the town. The only known records of activity at the town farm was recorded by the Overseer of the Poor in the annual town reports. It is estimated from these records that over the course of 40 years the number of residents at this farm varied from 6 to 12 per year. Any of them who spent their final months at the farm likely found their final resting place within the Cemetery of Unknown. Some of these folks had been prosperous citizens of Hudson but due to reversal of fortune or conditions, spent their final times here and were laid to rest in the yard at the end of the farm. The number of deaths which occurred here during these 40 plus years in not known; but it is estimated there was an average of at least 1 per year. There are no records to indicate who they are, when they passed, and where within the cemetery each was laid to rest. As time progressed the land upon which the burial yard existed continued in private use. Fewer and fewer residents of town retained any memory of this cemetery. Perhaps the stage was set for the Cemetery of the Unknown to be lost to history forever. 100 years after the town poor farm and the site of the Cemetery of the Unknown was sold by the town of Hudson, Paul Gauvreau and his family purchased their homestead on Old Derry Road. In talking with family of the previous owner, Paul was told about the Cemetery of the Unknown and that only a few people were still alive to remember that it existed; soon it would be grown over and all traces of the cemetery gone forever. In 1982 plans were made to construct a new road, Twin Meadow Drive, and to build a number of duplex residences. Aware of the existence of the cemetery but not sure of it’s exact location, Paul informed the Hudson Planning Board of the cemetery. The developer agreed to stop excavation if burial sites were unearthed. None were found and several duplexes were constructed along Twin Meadow Drive bordering the field off Old Derry Road. In 1990, Paul along with some of the neighbors on Twin Meadow Drive did some local detective work in the fields behind Twin Meadow Drive. After removing brush and mowing the tall grass on a flatter section of the field, they discovered what appeared to be several sunken grave sites. These depressions measured about 2 1/2 feet wide and about 6 feet in length and faced east and west; consistent with grave sites. The depressions were likely caused by the collapse of the wooden enclosures over the years. Paul contacted the town Executive Administrator, town Planner, and the Town Librarian . Upon visiting the site, all agreed the site was worthy of further study; but, since the form of town government was about to change, all agreed to postpone the matter until the new government was in place. Paul researched the Hudson town reports for the years 1845 through 1870; specifically the Reports of the Overseers of The Poor which lists the activities and financial transactions of the Poor Farm. It should be noted that reports from 1828 through 1844 were not available. He was able to compile a list of some 32 names of individuals that died as paupers associated with the poor farm during these years, either living at the farm or being boarded in private homes at town expense. Of these 32, 3 were buried in Nashua or Litchfield. Most, if not all if the remaining 29 were buried on the farm. It is not possible to discover the exact number or identity of the individuals laid to rest in this cemetery during it’s 42 years of operation. The names we do have include individuals from well known Hudson families: Barrett, Hamblet, Johnson, Marsh, Parker, Robinson to name a few. In August 1994, as agreed with the town officials, Paul contacted Mr. Gary Hume, State Archaeologist, and asked him to conduct archaeological probings. These probings and investigations took place during the fall months of 1994. Present at each of these sessions were representatives from the state, officials from Town of Hudson, the Historical Society, various neighbors in the area, and Paul Gauvreau. Paul had previously shared the results of his findings with both town and state representatives. In March 1996, the New Hampshire Division of Historical Resources issued a report of their findings to Hudson Cemetery Trustees. In essence this report confirmed the location and existence of the Cemetery of the Unknown. The report did not make specific recommendations as to how this cemetery should be preserved; but did direct the town of Hudson to proceed with the recognition and protection of the property. In the months to follow, the town of Hudson led by the Cemetery Trustees, purchased from the landowners the Cemetery of the Unknown (also known as Poor Farm Cemetery) along with an access easement from Twin Meadow Drive to the cemetery. On September 1, 2007 the cemetery was dedicated and a single monument placed there in memory of the estimated 62 individuals buried there over the years. The author and Paul Gauvreau visited the cemetery this past weekend and met with Susan Bauman whose home abuts the cemetery. Both Paul and Susan have maintained chronology of events leading up to the confirmation and dedication of this cemetery. Our thanks to them for sharing information with us. First a few words about Potash Corner and how it may have received its name. The term Potash refers to a variety of minerals which contain the element potassium in a water soluble form. The early settlers recognized the benefits of potassium both in gardening and as an ingredient for making soap. Its presence in the soil is a contributor to healthy plants and larger yields. Potash can be found in natural deposits; it is also a by-product of burning plant material such as wood. Thinking about it, every early New England home with their huge chimneys and fireplaces in each room had a ready source of potash. Back to the naming of Potash Corner. The name may have been the result of natural deposits of potash and the early farmers had developed a method of removing the potassium by soaking in water. It is also possible that the corner had become a central location to deposit excess wood ash and thus sharing the potash with others – like a community compost pile for potassium. It is also possible that some combination of both these events lead to the naming of potash corner. Whatever the origin, the name survived and still remains on many of the maps of Hudson. A small burying place, containing almost 3/4 acre, called Senter Cemetery or Senter Yard, was first located in the south west corner of Londonderry at Potash Corner. Likely set off from the Senter Farm from which it was named. Lookng at the names and dates on the inscriptions one can see it was used a burying place for Londonderry residents several years before the annexation to Nottingham West (now Hudson) in 1778. We do not know the date this yard was first used for burials. From the inscriptions recorded by Kimball Webster in 1908 the oldest date found was upon a rough stone marked E.L. K.I.D. Feb. 24, 1759 which probably stands for Kidder. The next to the oldest is the marker for Jean Senter, wife of John Senter, died Jul 10, 1765. John and Jean Senter were the grand-parents of Deacon Thomas Senter. If John Senter was laid to rest along side his wife his marker, along with many other, have long since been destroyed or disappeared. 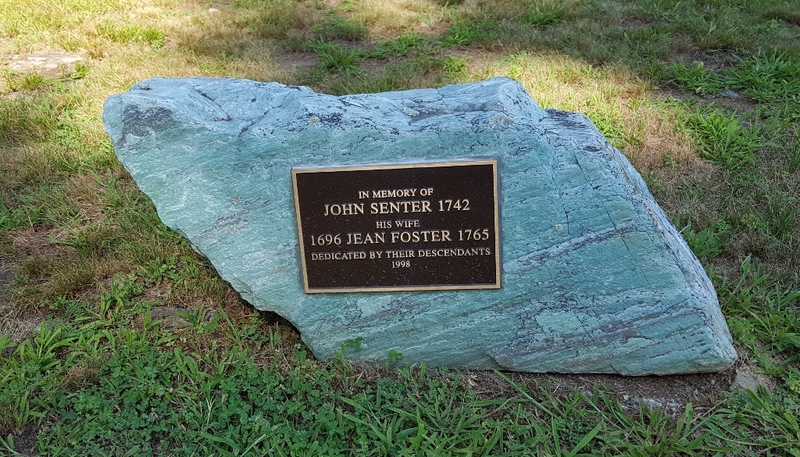 In 1995 the descendants of John and Jean Senter placed a memorial marker at the cemetery in their memory. At some early point in time the yard was enclosed within a respectable stone wall. As time passed and interest in the upkeep of the cemetery waned, the wall fell to disrepair and fell down is some places. Cattle could enter at will from adjoining pastures and the grounds became so covered with brush that the cemetery’s appearance was not a credit to the Town of Hudson. In 1897 the selectmen of Hudson caused the walls to be repaired and an iron gate erected. About the same time the brush was removed and the appearance of the yard was improved. Within this cemetery the surnames most frequently found are Andrews, Farley, Greeley, Hobbs, Kidder, and Senter. A large number of grave sites in this cemetery are not marked with head stones and inscriptions. Some of these sites may have never been marked; for the others the markers have long since been removed or destroyed. For the past several years the Senter Cemetery has been maintained in excellent condition by the Hudson Highway Department. A few years back the original iron gate was replaced by the Town Cemetery Trustees and Anger Welding. These photos ware taken by the author in August 2017. Best known as the home of Deacon Thomas Senter this farm was home to five generations of the Senter Family, beginning with Samuel the father of Thomas. The farm were settled in the South West part of Londonderry near “Potash” Corner. This was the part of Londonderry annexed to Nottingham West in 1778. We know the location today as the intersection of Old Derry Road with Robinson Road and a bit north of the Senter Cemetery. Deacon Thomas was born May 1753 in Londonderry, NH the son of Susan Taylor and Samuel Senter. Thomas married Esther Greeley, daughter of Ezekiel Greeley, circa 1775. Their family consisted of 7 daughters (Kate, Bridget, Susan, Charlotte, Esther, Rebecca, and Nancy) and 2 sons (Thomas, Jr and Charles). His wife, Esther passed at the age of 51 in 1800. Thomas married a second time to Mercy Jackson and a third time to Eunice White. There is no record of children born to these later marriages. Thomas was a farmer and he enlisted in the spring of 1775 for 8 months and served at the Battle of Bunker Hill. On May 1, 1805 the Baptist Church of Christ of Nottingham West (now the First Baptist Church of Hudson) was organized in this home by a council called for that purpose. The new church consisted of 65 members who had been “sett Off” from the Baptist Church in Londonderry. That very same council held an ordination for The Reverend Thomas Paul. For several years following the new church did not have a settled pastor. The pulpit was supplied by various pastors, one of whom was the Reverend Thomas Paul. The early church had two deacons. Thomas Senter was chosen as one of the deacons, the other was Moses Greeley. The anniversary of the organization of the Baptist Church (now at 236 Central Street) is recognized annually on or near May 1 as a Roll Call. Members meet, enjoy a meal, fellowship, and call the roll. When a member’s name is called they respond with a verse of scripture. This homestead remained with the Senter family until May 1889 when it was sold to Jeremiah Heath and his son George M. Heath. The Heath family owned the place until about 1921 when it was sold by Cora Heath, wife of George. Either just before or soon after being sold by the Heath family the ancient home was destroyed by fire. It is not clear if this was an intentional burn or not. From the June 30, 1921 article in the Nashua Telegraph we get a description of the house. The centerpiece of the house were two large brick chimneys probably made from Litchfield bricks. These massive structures remained standing after the fire; showing the huge arches in the cellar which supported 8 fireplaces. One for each of the rooms in the house. Cooking was done in an open fireplace. The house had a front and a back door which led into a hallway from which one you access any of the four rooms downstairs. The roof timbers were unusually strong and could have supported the extra weight of a slate roof. To my knowledge, all evidence of this house has been replaced by more recent developments. While researching Moses Greeley for last week’s article and Thomas Senter for this week, I began to understand the significant role each of these gentlemen had to our town’s history; and the similarities of their lives. Let me share: They were farmers and neighbors, settling on the Derry Road. They had adjacent farms and their houses were within 1/2 mile of each other. They were both charter members of the First Baptist Church and both were elected as one of the two deacons for the church; a position held for life or until one resigned. They were not related but their lives and the lives of their families were interwoven. You see, Moses and Thomas married sisters. Moses’ first wife was Hannah Greeley. Thomas’ first wife was Esther Greeley. These ladies were the daughters of Ezekiel Greeley. The relationship between these two families continued beyond Moses and Thomas. This photo of the Senter Homestead is courtesy of John Senter of Nashua; a direct descendant of Deacon Thomas Senter. Do you have memories of the Nadeau Dairy Farm at 98 Old Derry Road? Perhaps you stopped by and visited the cows; taking pictures while they grazed in the field or lay resting while they chewed their cud to take digestion to the next level!! Perhaps you drove past and saw the tractor and hay baler getting the crop ready for winter storage. One of my memories is intentionally driving past the farm near Halloween to see the numerous Jack-O-Lanterns positioned along the side of the road, gazing out of a barn window, or perched and lighted from the top of the blue silo. This was a local tradition prepared for us by the Nadeau family with help from friends and neighbors. This four generation dairy farm had it’s beginning in 1902 when Joseph Lambert and his wife Mary were living in Nashua but looking to move to a dairy farm. In July of that year they purchased this home and farm from the heirs of Jackson Greeley. Joseph ran a milk route into Nashua. He later added chickens and pigs with the remainder of the farm was used for grazing and growing feed for the cows. Joseph and Mary raised a family of six. Their daughter, Marion, married Emery Henry Nadeau in 1935. They lived on and worked the farm with her parents; purchasing from them in 1941. For another two generations and most of 70 years the farm continued; first with Marion’s son Emery E. and later with her grandson, Emery E.,Jr. The senior Emery E. was responsible for the day to day operations of the farm since the age of 14 when his dad, Emery Henry, took a job in Nashua. By 1961 Emery E. and Shirley (Craig) were married. They raised a family of 3 children; Lori, Emery E. Jr, and Elizabeth. The younger Emery joined the family business upon graduation from Alvirne High School in 1982. By 1995 Emery E. then age 50 was working a herd of 75 milkers which produced about 205 gallons a day!! The electronic milking machines delivered the milk directly into a storage tank where it was cooled and kept at temperature until drained by a milk hauling truck in the small hours of the following morning. At that time this farm was the last commercial dairy farm in Hudson with the exception of the farm in operation at Alvirne High School. Working the farm was hard work which was done by the entire family with help from neighbors during haying and harvest time. The Lambert/Nadeau farm operated for nearly 100 years; from 1902 until 2000. Within a short time machinery, livestock, and property were sold. The homestead and farm buildings on the south side of the road were purchased by Keven Slattery. Using much of the old farm buildings it is the location of Nadeau Industrial Park. The farmhouse has had many improvements and is now a 2-unit rental. The acreage on the north side of the road is under development as Senter Estates. In 2009, following his avocation for the dairy farm, the younger Emery was hired as the Alvirne Farm Manager. His mother, Shirley remains active; working at Checkers Restaurant within the culinary department of Alvirne. This past month, as part of the Second Annual Historical Society Gala, Emery Nadeau, his mother Shirley, sisters Lori and Elizabeth and their families were awarded the Community Service Award for their work to make the Alvirne School Farm a valued resource in Hudson. The house at 98 Old Derry dates to 1793. Jackson Greeley, the youngest son of Moses and Mary (Darby) Greeley was born in Hudson November 1815. Moses Greeley was born in Haverhill, MA in 1787. By 1793 he had moved to Nottingham West and was a single father with two young daughters. His first wife, Mary Greeley, had recently passed, and he was (or soon would be) married to Mary Darby. It was Moses Greeley who was responsible for building this farmhouse. He and his wife Mary had 10 children of their own; plus Moses’ daughters from his first marriage. Moses lived in this farmhouse until his death in 1848 at the age of 83. Ownership of the farm passed to Jackson Greeley who likewise resided here until his passing in 1894. It has been said that this home was used as a tavern because of the location on the roadway between Nashua and Derry. This may have been the case but, based upon what I have read to date, I cannot state it as a fact . The earliest known residents of this farmhouse were Gilman Andrews and his family. Gilman was born in Hudson (then Nottingham West) in December 1806. In September 1834, at the age of 28, he married Sophia Senter. Sophia was a local girl; the daughter of nearby Charles Senter and the grand daughter of Moses Greeley. A few years after their marriage, in December 1836, he purchased this site from Abijah Hills. Gilman was a farmer. The agricultural census shows his farm consisted of one horse, 5 milking cows, one pig, and produce of corn, oats, peas, beans, potatoes, hay, butter, and cheese. There is evidence of an earlier house, located east and north of the present one; but it is not clear if this was an initial residence for Gilman or for some older half sibling of his. Gilman remained on his farm and in this house until his death in 1886 at the age of 79. This was the childhood home of Gilman and Sophia’s three children: Charles (born 1837), Mary Jane (born 1839) and George Gilman (born 1847). As adults each lead very different lives. Charles moved to Nashua and worked as a as a station agent for the railroad. As a young lady Mary Jane taught school at the nearby Number 9 school which was then located on Old Derry Road near the intersection with Greeley Street, She was also a talented musician. She played the organ at the Baptist Church and was a member of the Hudson Singing Society. In fact, the Mason and Hamlin Organ she played at the church has been restored and is at the Hills House. Mary Jane married Hudson native Harvard Payson Smith in January 1864. In 1857, at the age of 19, he left Hudson for Red Wing, MN. While there he was a school teacher and involved in the laying out of roads. In 1861 he returned to Hudson and began the study of medicine until the outbreak of the Civil War. He enlisted and served as a sharpshooter serving a little over 3 years. After their marriage he returned to Red Wing with Mary Jane. They later moved to Lake County, Dakota. In 2013 a number of memorabilia and documents pertaining to the Andrews Family and life in Hudson were returned to the Hudson Historical Society from a museum in Madison, SD. From these we have glimpses into her life here in Hudson. George Gilman (born 1847) remained with the farm and took it over after Gilman’s death. He also became a successful business man and purchased a general store at Post Office Square in Hudson, serving as postmaster. He also held many offices in the Town of Hudson. He build a fine Victorian style home for his family on Main Street (now Ferry Street) – located about where the current Gulf station is. George maintained the farm and operated his business interests until September 6. 1908 when he was tragically killed during an electric car accident on the Pelham line as he and his wife Anabel were returning home. She was severely injured and lived the remainder of her life in Hudson. Their daughter, Maude, a well known Hudson resident resided with her mother on Ferry Street. After George’s death Anabel sold the farm to Rachel Ober in April 1904. The Ober family was living at the farmhouse in 1933 when fire destroyed the upper stories of the C 1830 21/2 story home. Our first photo is that of the original home of Gilman Andrews and Rachel Ober prior to the 1933 fire. The place was inactive until purchased by the Jasper Family in 1941. The home was then remodeled to the 1 1/2 story building with a front porch which we see today. It became the home of Robert and Reita Jasper and their young family. After the Jasper properties ceased to operate as a poultry farm, Robert and Reita established and operated a camping area known as “Tuck A Way” in the area behind the farmhouse. In 1985 the property was transferred to The Nash Family. Since that time some acreage was transferred to the State of New Hampshire for the proposed circumferential highway. Our second photo shows the 1 1/2 story house from town records C 2012. Thanks to the Jasper Family for the early photo of the Andrews/Ober Home.